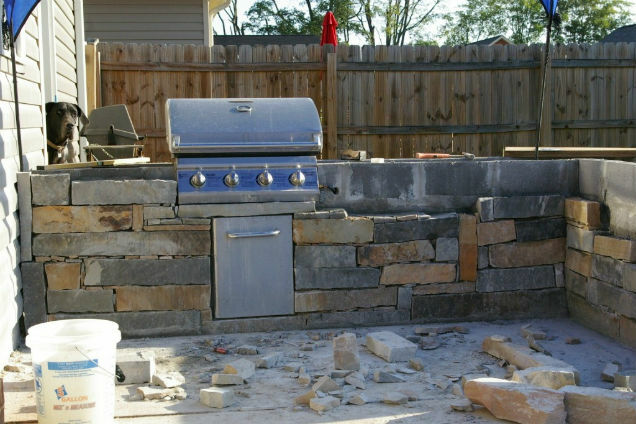 This is a custom outdoor kitchen project under construction. Every project has to start somewhere! We take pride in constructing our outdoor kitchens and patios in a timely and efficient manner, without sacrificing any quality. As we lay the stone foundation of the kitchen, the sturdiness and durability of the stones and the foundation is always double checked. Outdoor Kitchen Project Looking Good Before Its Even Done! As you can see, all of our projects are custom to order and built to the owners standards. This outdoor kitchen project in Houston, TX turned out to be a beautiful finished project. A great outdoor kitchen in the backyard is a great investment, and this owner would definitely agree! At Houston Outdoor Kitchen Pros, we pride ourselves in making quality outdoor kitchens in a timely, efficient manner. Call us today at (832) 409-3542.